Imagine you have been asked to design an incentive program to promote the sale of cleaner vehicles in your city. You are convinced that purchase price incentives are the key to shifting consumer choices. 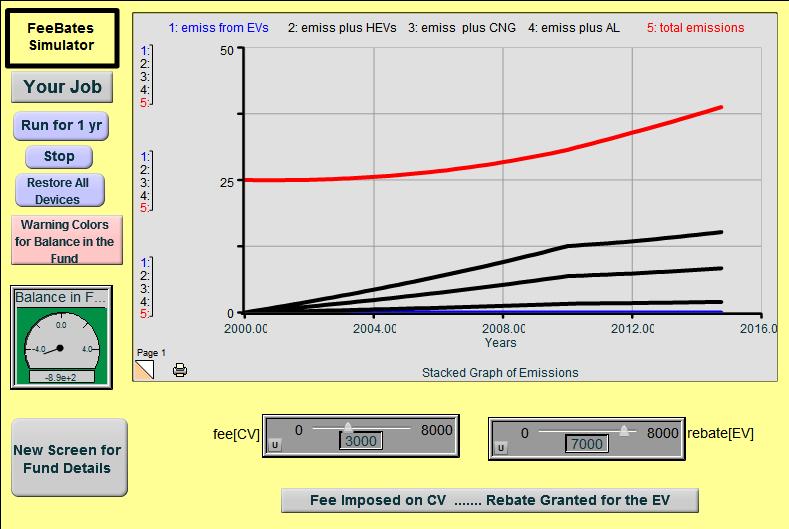 You believe a large rebate could encourage the purchase of electric cars and other alternative-fueled vehicles. 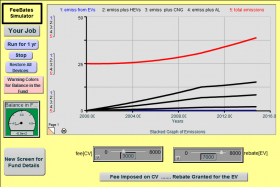 This is the background story for an online simulation that allows students to experiment with applying fees and rebates to automotive sales to help reduce air pollution. As the player, your job is to manage a “feebate” program for the city that will help reduce vehicle pollution. The program offers large rebates on purchases of cleaner vehicles, (electric vehicles, hybrid-electric vehicles and vehicles fueled with compressed natural gas) and imposes fees on vehicles that have high pollution rates. This context is laid down in chapter 16, “Managing a Feebate Program for Cleaner Vehicles”, of the 2nd edition of Andy Ford’s book Modeling the Environment. Ford is a Professor of Environmental Science at WSU where he teaches computer simulation modeling with an emphasis on energy and environmental problems. He’s also a long-time STELLA user. Since the Feebates simulation can be run online via the interactive control panel, it’s an excellent means to explain the policy to city officials. The isee NetSim software allows modelers to publish the “control panels” they have built within their STELLA & iThink models online so others can run the simulations in a web browser. Over the years I’ve seen a lot of really insightful models created with STELLA & iThink. Throughout the development of the isee NetSim software, I envisioned modelers sharing insights online; making Systems Thinking models available to anyone, instantly. I was curious to see how users would use this new ability to communicate. I’m happy to see that Ford’s book lays out one real-world scenario. In the fictional city of the Feebates Simulator, millions of new cars are sold each year. One major issue is that the cash flow for the rebates could be enormous. The feebate program is designed to be self-financing, so your job is to keep enough fees flowing in to pay for the rebates flowing out. If the flows are kept in balance the program will operate in a revenue neutral manner and avoid an unpopular “tax label”. Can the program operate under these guidelines and still help to reduce overall emissions from vehicles? I asked Andy how he was using the Feebates Simulator in teaching his classes. Oh boy, is he right – the change in cash flow is rapid! There are pop-up messages built into the simulation that inform you if the fund has too much money or has fallen too far into the red. The result in either case is the same: the governor asks you to resign. Game over. During my first couple of runs with the simulation I saw quite a few of these messages. You can take it for a spin yourself right now by clicking here. What can people take away from this simulation? The background on feebates in Ford’s book is an excellent example of how to think about a complex issue using Systems Thinking. From a systems point of view, the program is appealing because the extra, hidden cost of the “dirty” vehicles is made apparent to the consumer through fees. 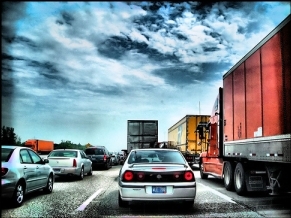 Adding this feedback into the system will begin to shift sales in the direction of cleaner vehicles by supplementing market forces that create supply and demand for vehicles. But the simulation makes it clear that it is important to keep the program’s fund inflow & outflow of money in balance or the governor will call for your resignation. Why? 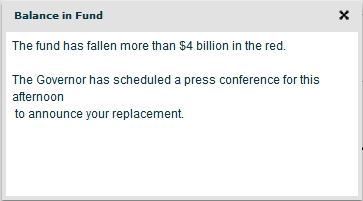 Because the fund will either go bankrupt or lose public support if its viewed as a tax. So is it possible to maintain the fund under these conditions and reduce overall emissions? The Feebates Simulator is an excellent vehicle for experimenting with the program before it is actually implemented and trying to answer these questions. We recently published a NetSim that models supply and demand within the context of the recent collapse in the US housing market. One of our customers, Philip Specht, emailed this simple but informative model to me: You’re driving on the highway and around the curve is an overturned truck. Can you stop in time? Phillip said he’s been using the model for years to teach his medical students about Systems Thinking and simulation and thought we would find it useful too. I published it online and it’s now included with our other sample NetSim models. My friend Chris Soderquist has created a few “online learning laboratories” dealing with energy issues. Do you have any interesting models that could use an online “control panel”? Ideas for models? Ideas for interfaces? Post them in the comments.